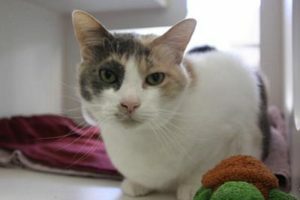 Samantha is a sweet, and still very agile, 10-year-old Calico. Sam is looking for a loving home where she can display her adoring yet independent and therapeutic tendencies. The Yavapai Humane Society (YHS) has a plethora of lovable senior (5 years and older) cats available for adoption. These sweet animals have many good years of love left – making them ideal pets. All adoption fees for all YHS cats and kittens have been waived for the month of June. That’s a real deal because YHS cats are spayed or neutered, vaccinated and micro-chipped – that is over a $400 value to you – for whatever you are willing to donate. If you are a senior citizen you might be especially interested in knowing that according to the Journal of the American Geriatrics Society there are many health benefits for seniors who have a pet or two. In fact, the Journal states the benefits extend to the seniors, the pets and society as a whole. Geriatric researchers found seniors with pets are more active than seniors without pets and they score higher in their ability to carry out normal activities of daily living. Many positive effects on physical well-being are identified, including a healthy ability to fend off isolation and loneliness. The Journal report says that pet ownership has a statistically significant effect on the physical health of older people. Further, the caretaking role involved in pet ownership may provide older people a sense of purpose and responsibility and encourages them to be less apathetic and more active in day-to-day activities. In fact, researchers found that elderly people who lacked strong social support (family and friends) remained relatively emotionally healthy during life crises compared with non-pet-owners placed in similar situations. The evidence demonstrates that pets provide real health benefits to the elderly. If you are a senior citizen and want to take advantage of all these health benefits please consider adopting one or two of our senior cats today. All cat (and kitten) adoption fees are waived for everyone during the month of June; and for senior citizens (59 and older) adoption fees are waived all the time for both cats and dogs over 5 years of age. Health benefits are not restricted to seniors only but apply to all people of all ages. Adopt a pet today!